Bill's back - but is that Polly? So it seems Bill is back. But will we see Ben? Is that a glimpse of a recast Polly in the trailer? It is Polly, isn’t it? But not Anneke Wills. Will we see a recast for the late Michael Craze? Mark Gatiss is the “resonant” Captain. 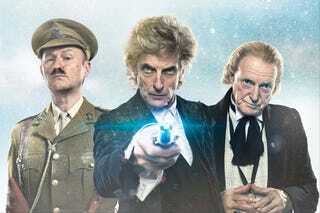 Is Twice Upon A Time the new title? No Jodi yet! Get ready for a regeneration overdose!